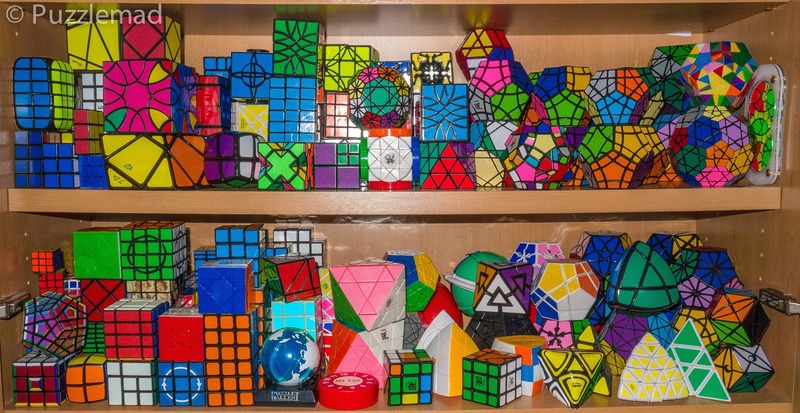 Oli's twisty puzzles - for a non-twisty puzzler he sure does have a good collection of them! This might be a little less coherent than normal - yesterday was a rather busy day in the Sheffield operating theatres and emergency room - after a very long and very bloody day I was so whizzy that sleep eluded me for a large part of last night! Plus of course it is not easy to write about twisty puzzles. 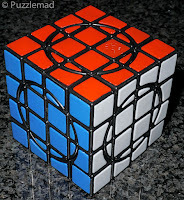 All you non-twisty puzzlers DON'T run away - whilst this post is about twisties it will still be of interest to you and may cause you to rethink your aversion. Keep reading! "If you can only choose one from the above selection then what would it be?" 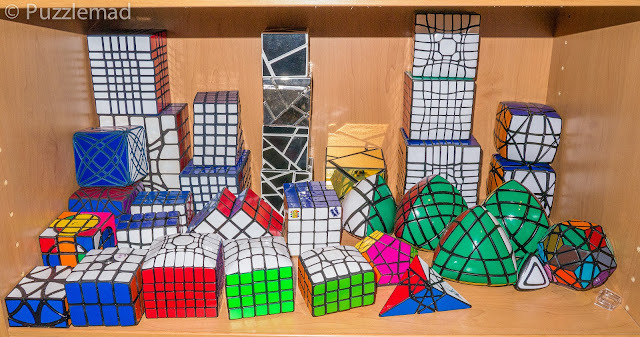 You can see in the picture there are some rather lovely puzzles with varying shapes and difficulties and many would expect me to choose one of the more abstract (if that's the right word) designs. 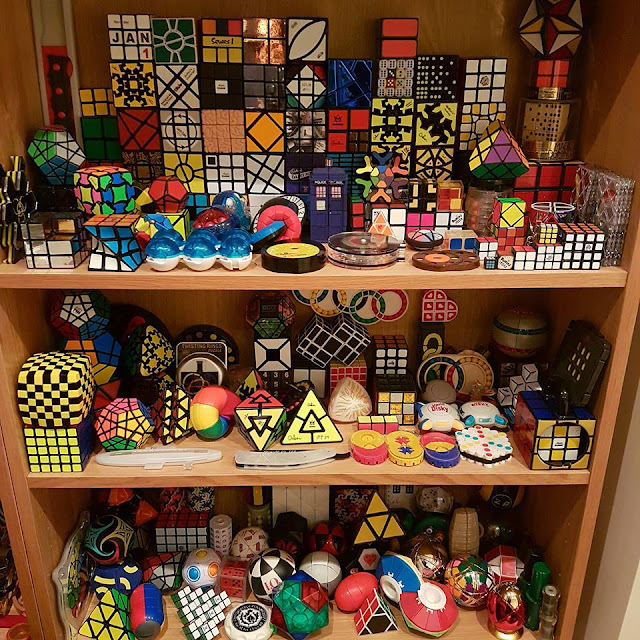 Now as a bit of a mad twisty freak (along with the general madness of my puzzle collecting), I already had pretty much all of the puzzles on Oli's shelves. I therefore altered my interpretation slightly to say which of those puzzles I would choose as one not to miss out on or which of those twisty puzzles would be my 'Desert Island Puzzle'? My choice.... nothing fancy, nothing oddly shaped, nothing with circles etc. 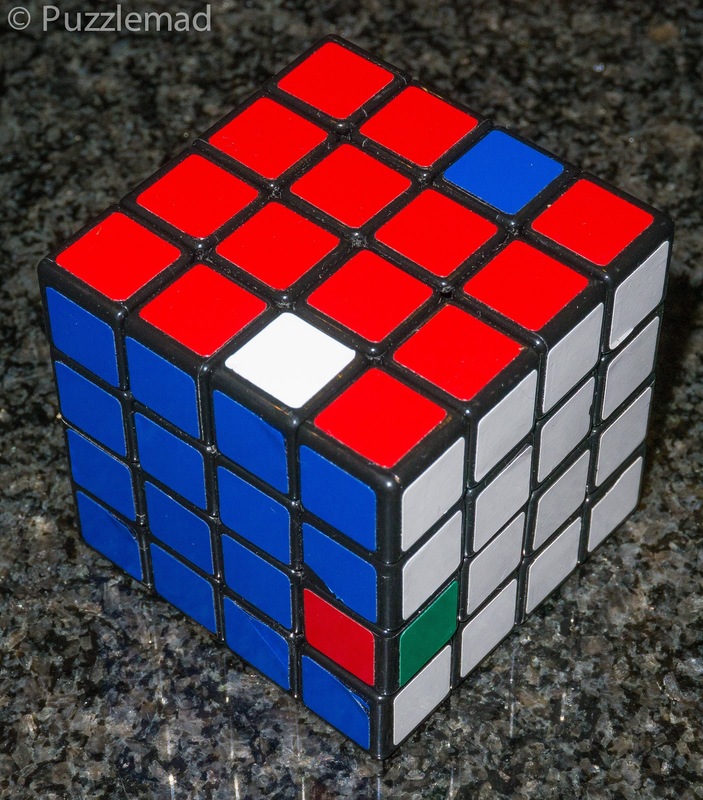 I chose the standard 4x4 Rubik cube. Yep! With all those to choose from I went back to a standard cube. BUT I will try to convince you that with a bit of thought this can be made into a much more interesting puzzle. In my workbag I carry a 4x4 with me pretty much at all times - you can see from the state of it that it has had a fair bit of wear and tear. I bought it quite early on in my puzzling career and I have replaced the stickers a couple of times already. 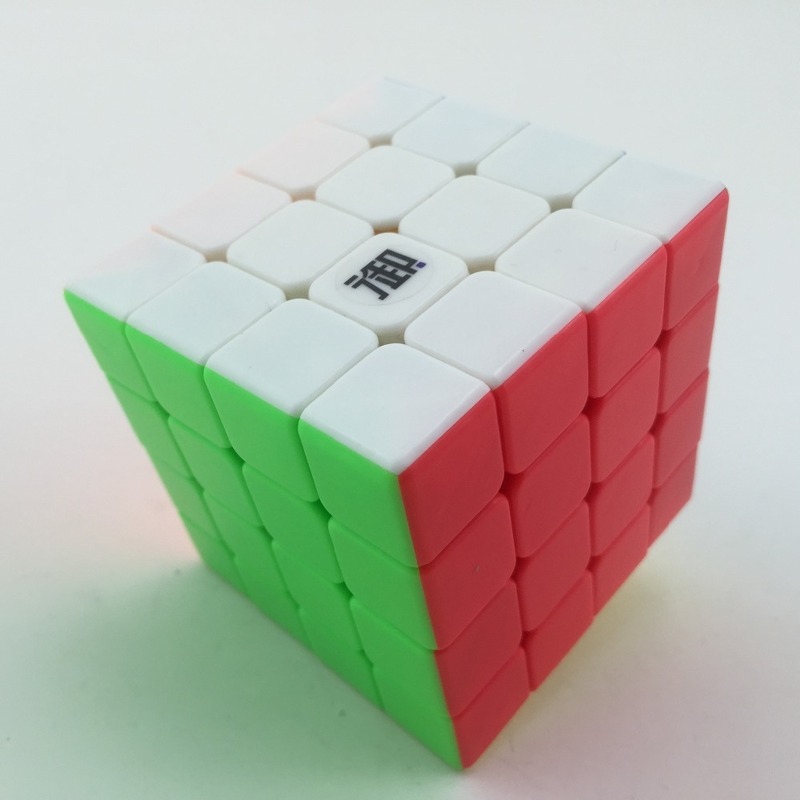 In fact I am so fed up with the state of it that I have decided to replace this cube with a nice shiny new one... this time a stickerless one so I never have to worry about the state of it again (I already have a stickerless Dayan Zhanchi with me most of the time). After a nice on line chat with my friend Marty (owner of The Puzzle Store UK) in which he gave me some advice, I have placed an order for a nice new stickerless 4x4 and also decided to get a stickerless 6x6 too (to replace the 6x6 gift from Yvette that I unfortunately broke a year ago). "why would he choose a 4x4 out of all the puzzles available? Look at all the puzzles in his collection and all the other twisties he owns!" You are right to question my sanity but not because of this. I may be considered mad when you think about the shear amount my hobby has cost me and the fights I have had with Mrs S but choosing a 4x4 as my desert island puzzle is actually a really good idea. Firstly I was only supposed to choose from the photo posted by Oli but even if I was to choose from my own puzzle collection it would remain the same. Why not the standard 3x3? 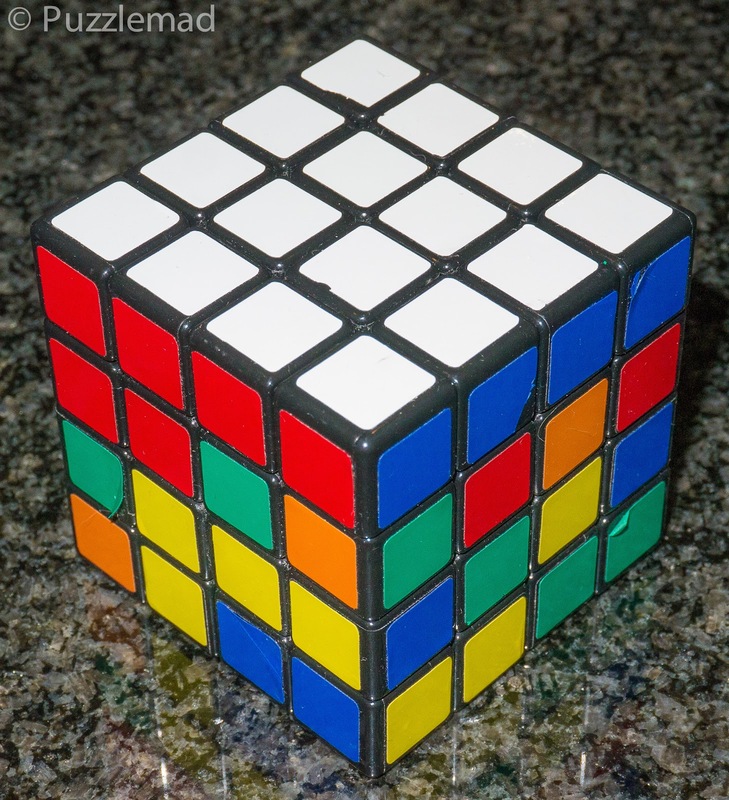 I do love it and carry it with me all the time but I now prefer even order puzzles for the extra challenge provided by the parities (I discussed how parities are a thing to be revelled in here and here) and also just having a bigger cube adds the dimension of having to pair up pieces. 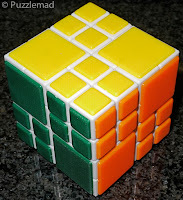 I dont really need a massive puzzle - I do enjoy my 10x10 but it is not particularly portable and quite hard on the hands and wrists after a while. A 4x4 or 6x6 is much more manageable. If you are on a desert island you will want a puzzle that is repeatable as you may be there a very long time. My wooden puzzles (burrs, packing puzzles, puzzles that happen to have a cavity) are all very lovely but by and large they solve just one way and once done there is no further puzzling challenge to them. What is more, there are a few burrs that absolutely frighten me to death and confuse me terribly - some have been played with and are in a configuration that I am unable to advance from and am unable to return to the beginning. It could be argued that these would provide a nice big long challenge but my experience is that after a while my frustration gets the better of me and I have to leave it alone. 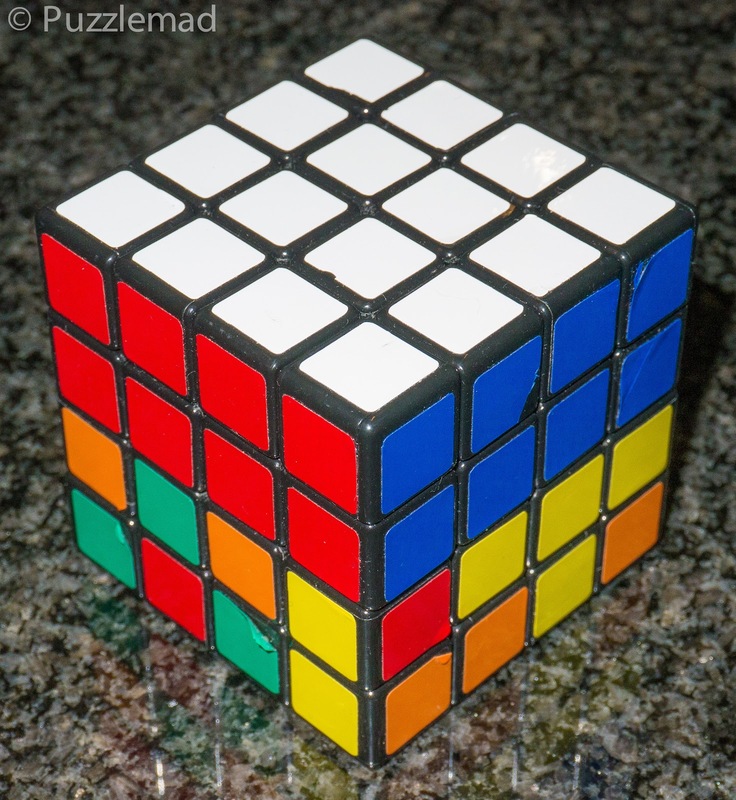 I personally never seem to get bored solving a standard cube - every scramble is slightly different. 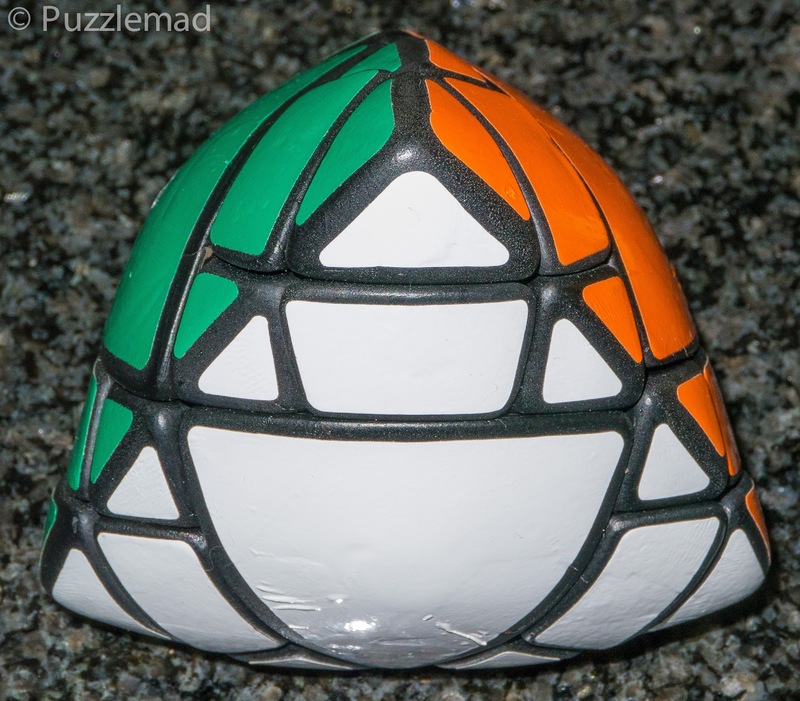 This puzzle is trapped in this position! Not only is repeatability important in terms of every scramble being different but also it is even better if there are multiple different challenges possible within that same puzzle and here the 4x4 really excels. Notice the large centres and completed double edges? 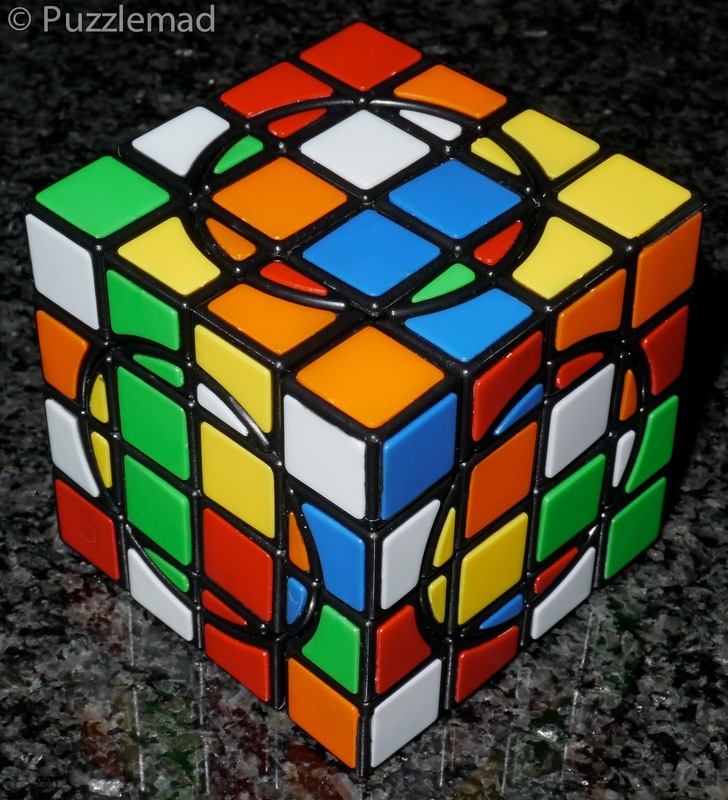 The usual way that a new twisty puzzler learns a 4x4 is to carry out a reduction technique.and the usual method is to reduce the 4x4 to an oddly shaped 3x3 with giant centres and edges and after that solve that 3x3. 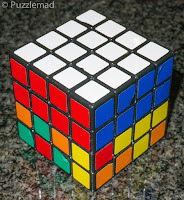 The parity comes about if one of the edge reductions has produced an edge in a conformation that is not possible had it been a standard 3x3 scramble. The challenge is to unmake that edge and remake it the other way around without ruining all your other pieces. There are a few algorithms for it but for me I always fall back on SuperAntonioVivaldi's Redbull algorithm which once done a few thousand times becomes second nature (I am much too old and cannot remember any other method). 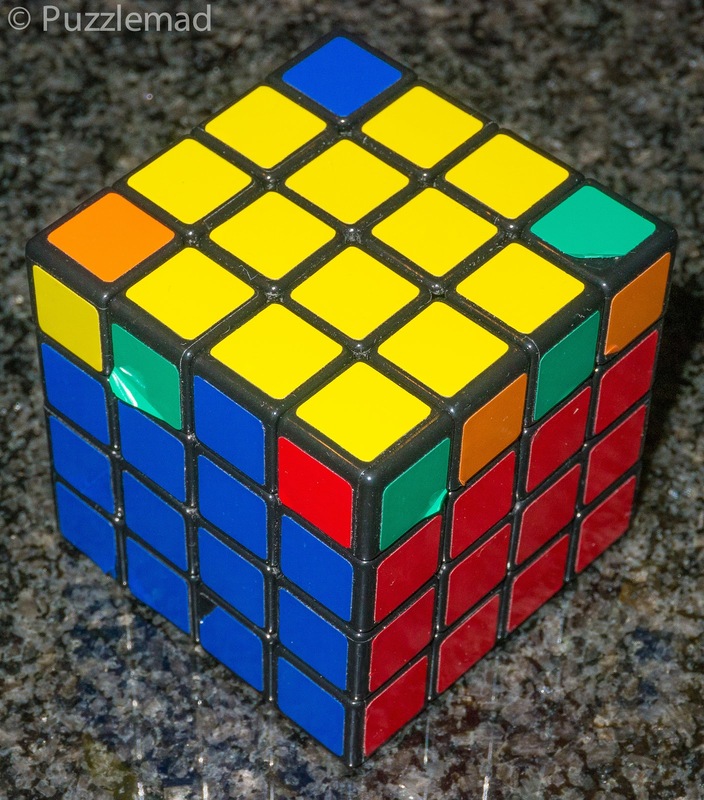 The commonest way to solve a 3x3 is to solve it layer by layer (beginner's method or more complex speedsolving approach) and I did wonder whether a 4x4 could be solved in the same way. This would be challenge number two. It is less arduous than reduction and the first part is really pretty simple. Using basic intuition and a modification of the F2L method for edges the first 3 layers are a pleasant task. 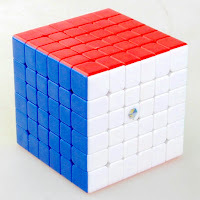 At this point it does become a tremendous challenge - the top layer fix requires all the parts of the basic 4x4 cube to be done with almost no freedom to move. I love it!!! 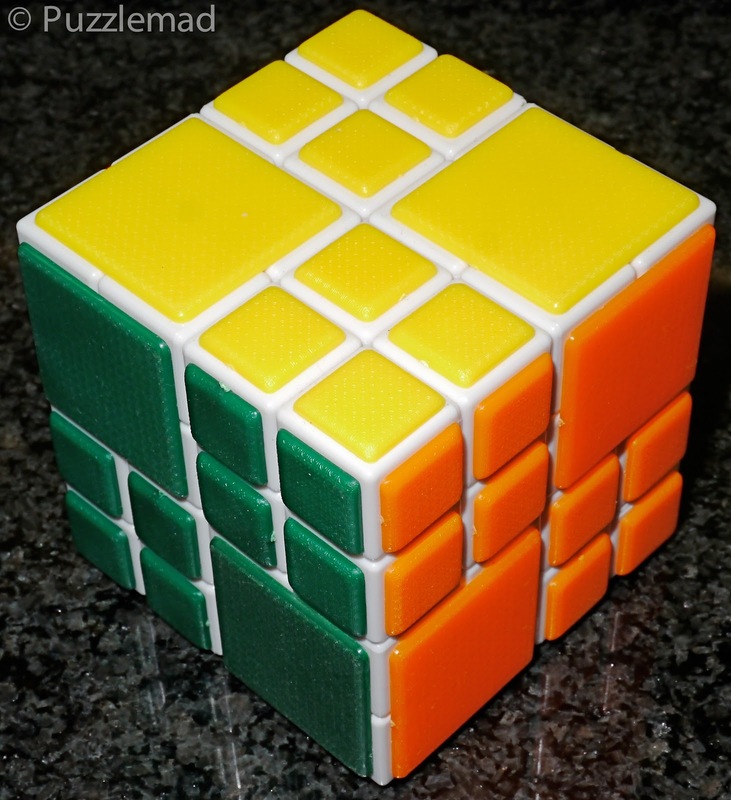 It does not require a lot of algorithms - the basics would be the flipping 2 edges method just like one would for a standard 3x3 and then maybe that a cuboid type adjacent corner swap using 2 enlarged corners might be useful. 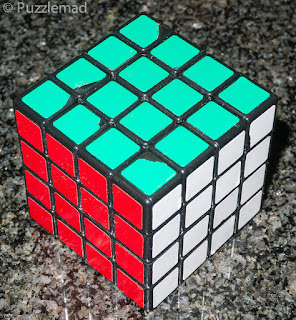 Looking at the pic above the back right edge is a complete red and yellow pair whilst the other 3 edges are mixed up. If I swap the 2x2x1 layer at the front with the 2x2x1 at the right then this will pair up all the other edge pieces et Voila! Sometimes they cannot be placed in that way and the very simple staple technique that is used frequently in other places... a commutator very similar to the corner piece series which SuperAntonioVivaldi calls the Swinging U algorithm. When you have all of these under your belt (none are particularly tough individually to learn) then the best bit is that they need to be put together using a whole lot of strategy and thought. 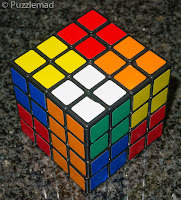 It is huge fun and a great challenge that involves more thought than simple algorithm learning. Basically you are using the same extended set of relatively easy techniques in rather wonderful ways. 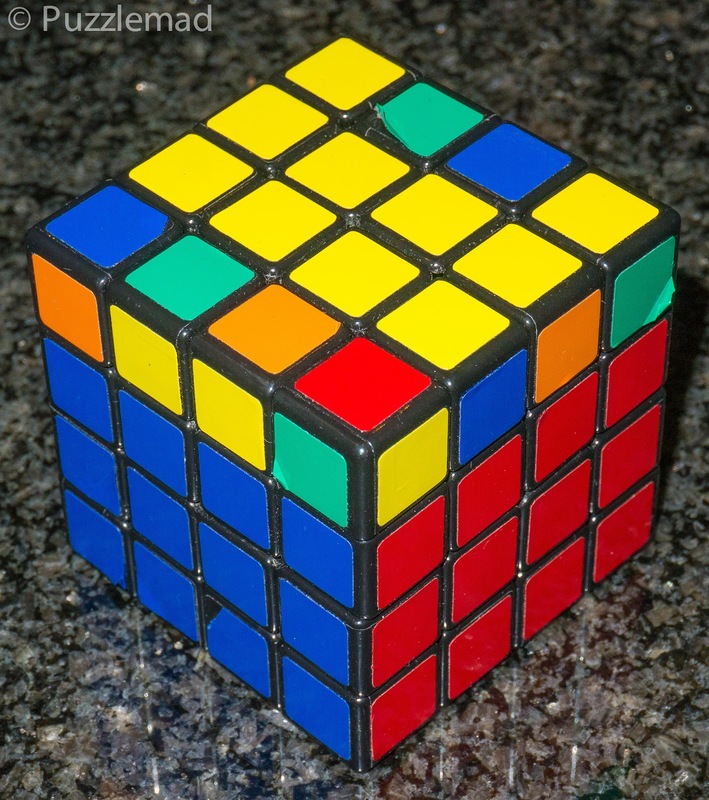 I have said many times before that I am too old to learn lots of new algorithms - I have learned a few basic ones and now can use them creatively with thought, planning and strategy which is what puzzling is all about. The giant cubes need to be moved to the bottom row and then the 2x2 blocks will need to be manipulated using only centre cut moves vertically and the top slice is the only single face that can turn. I seriously struggled with this concept for a very long time and my ability to solve it was very hit and miss until my acquisition of a tetrahedral modification of this forced me to reevaluate the approach or leave a puzzle unsolved on my shelf forever. After watching the video from SuperAntonioVivaldi in which he explains his approach to making a commutator for this tetrahedron, I was finally able to understand it and now my AI knowledge is complete. 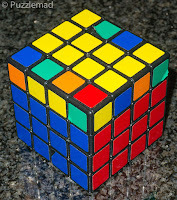 The AI solve of the 4x4 is definitely a real challenge for all puzzlers and very much to be recommended. Finally an alternative to the AI solve is still to reduce into a 2x2 form but to carry out the AI component whilst ignoring the centres. 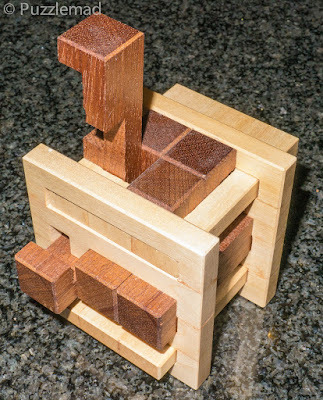 This entails forming the frames of the upper 2x2 blocks and then solving the centres last. The idea sounds awful until you realise that the method used by any 4x4 puzzler to assemble the last 2 centres during a standard solution (before the edges are reduced) uses a simple method (the swinging U) to 3 cycle pieces without destroying anything else. 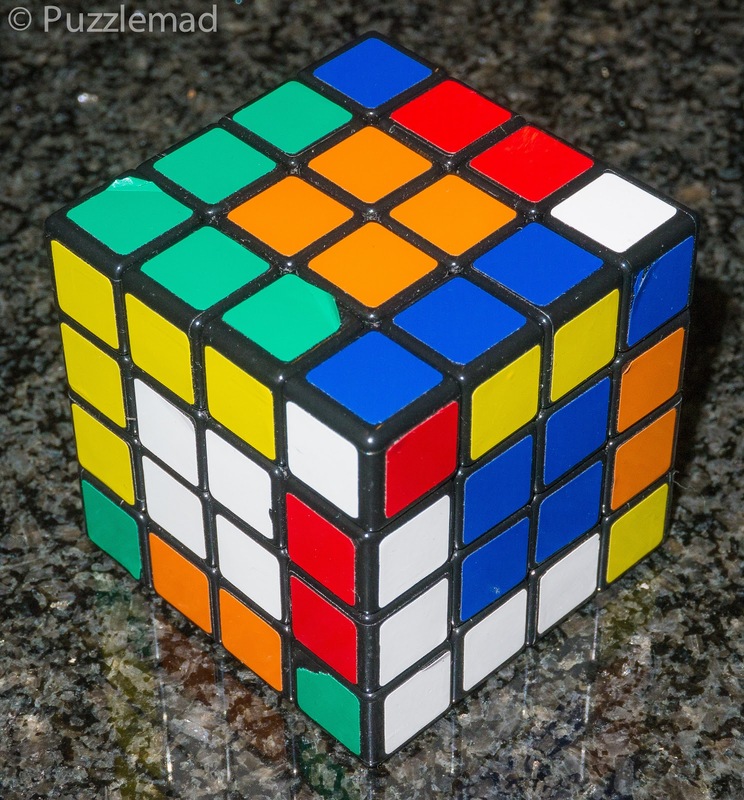 This approach to the 4x4 can be used with other even order puzzles - the Master Kilominx is an even order dodecahedral puzzle which has the same possibilities - the parity caused by edge reduction is a fairly horrendous thing to reduce as there is no equivalent of the RedBull algorithm. 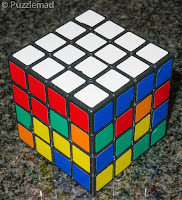 Part of a challenge a long time ago was to find a parity free solution. This was the equivalent of reducing the Master kilominx to a Flowerminx (the 2x2 dodecahedral equivalent) and again proved to be a wonderful diversion. I am also starting to drool - when Marty sends me the new 6x6, I can see that there are many many different reduction possibilities to keep me amused (even more than the 4x4) and I plan to add this to my increasingly heavy work bag to keep me busy and remind my surgical and anaesthetic colleagues that I am truly crackers! I couldn't choose the 6x6 as my choice from Oli's collection because he doesnt have one - it may be that it would end up as my desert island puzzle that isn't from Oli. even if it looks impossible! Finally just to finish off and expand the theme of alternative approaches, my amazing friend Jon (aka SuperAntonioVivaldi) set a test or 2 for his subscribers regarding alternative reductions of even more complex puzzles - he set a wonderful pair of challenges (here and here) for a tremendous puzzle, the Crazy 4x4v2 (PuzzlestoreUK or PuzzleMaster). 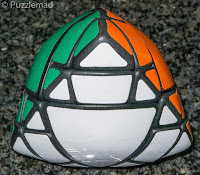 It is a real fun and beautifully made puzzle that all serious twisty puzzlers should own and solve - I reviewed it here many years ago. Basically the idea is to solve this 4x4 variant using a layer by layer approach and also try to solve it as an AI cube (just as we did for the standard 4x4). I have spent the last month working on this and OMG! What a challenge! I have pretty much managed most of it - there is one aspect of the layer by layer that I struggle with and the AI proved a heroic task but I got there eventually! 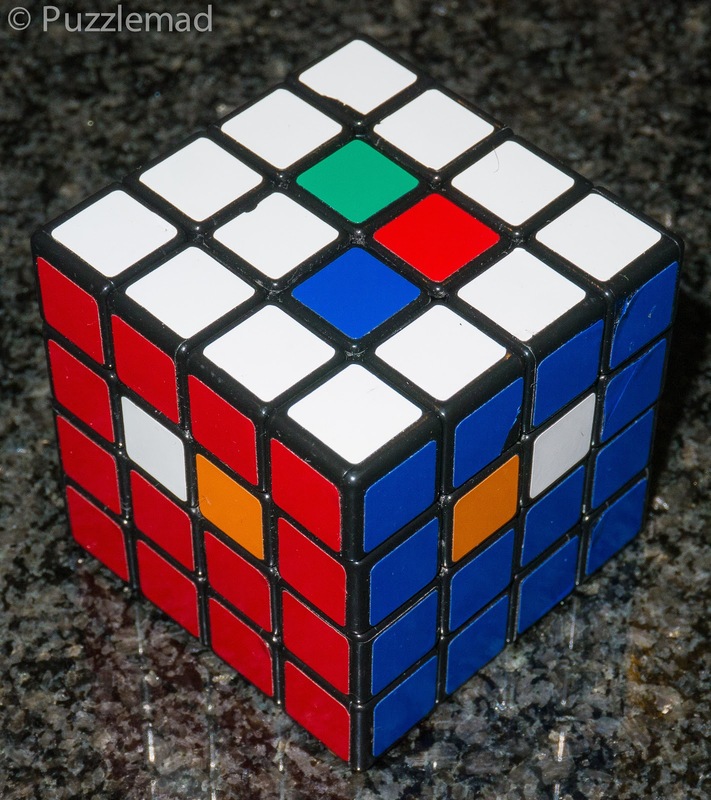 It would not be a terribly exciting blog post for most of you to describe the trials and tribulations of this but let me just say in the theme of alternative solve methods this one proved fantastic! To all you twisty freaks....buy it! Try it! You won't be disappointed. Let me know below whether you try any of these puzzles and approaches and what you think? A desert island puzzle? A good burr set with 1 page (laminated to withstand the weather and wave conditions on the desert) full of assemblies (but without orientation, just lists of 6 pieces that can be combined together) is awfully replayable. 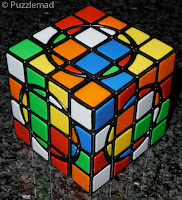 It isn't really repeatable - I wouldn't do 1 particular assembly and then repeat, but one could have hundreds of assemblies of various difficulties to spend a very long time puzzling without just repeating the exact same sequence again and again (though it could get samey after a while, but so would a twisty). p.s. I'm waiting for your review of the remaining puzzles from the Pelikan batch, since these really look great and I suspect that they will be available for sale in short proximity of that review being published. Yes! You are quite right a good big burrset would also make a very good desert island puzzle but that wasn't in Oli's photo. I do have 3 absolutely stunning burrsets to choose from. 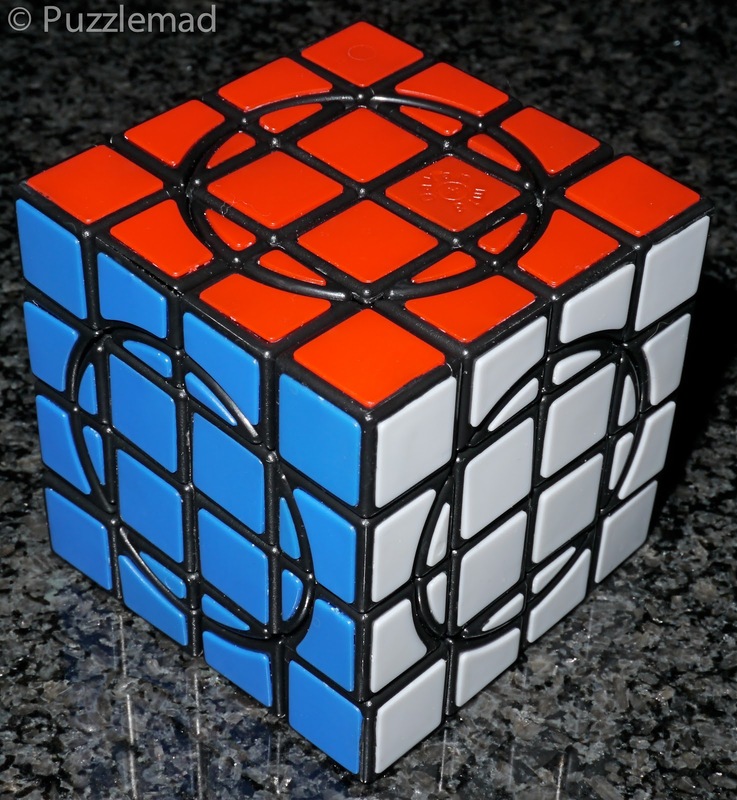 If you can solve basic twisties and want to get something interesting then you need more complex twisties - have a look at Eitan's star or the series of crazy planet cubes or megaminxes! The Pelikan puzzles will be coming out soon and the reviews will be on their website. I will hopefully publish here soon as well.